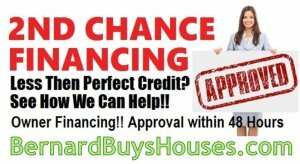 We Offer Seller Financing On Many Homes! BernardBuysHouses.com has helped many people in Massachusetts, Connecticut, Rhode Island and surrounding states STOP PAYING RENT and START OWNING their own homes. We do something that very few companies in the real estate industry are willing to do. We give good people a second chance… and it happens because we own the home we are selling and finance them to our buyers. NO BANKS! Since we own all of the properties we offer for sale… we can guide you through a quick, easy, smooth closing. Many times the payment to own a home is less than what you’ve been paying in rent. Now is the time you achieve the “American Dream” and own your own home. BernardBuysHouses.com offers the perfect solution for those who don’t fit into the traditional home buying plan. Yes, it would be great if you could get a new loan from a mortgage company or bank but sometimes you just can’t (For whatever reason). Don’t have CASH? We take trades as well. We have taken land, vehicles, boats, jewelry, and other items of value for down payments in place of cash … We don’t know any mortgage company that will do that! Choosing a “Seller Financed” home makes perfect sense and don’t be surprised if your monthly payment is equal to or less than the rent payment you are used to making. BernardBuysHouses.com is looking for good people who may have had bad things happen to them in the past that prevents them from currently qualifying for a traditional mortgage. The key words are “in the past.” If you’ve had problems but the problems are over… we are willing to give you a second chance and overlook your credit issues. Your credit isn’t as important to us, as long as you have a reasonable down payment (cash or trade value), verifiable employment and income to afford your payments, good rental history with no recent evictions, no major felonies, and contactable references. Step 1: Check our inventory and Drive by any of our available homes. Step 4: Call 774-415-0087 to set up a time to see the inside of the property.